Does global warming cause hurricanes or the other way 'round? The invention of modern computers and information systems has created an avalanche of information overwhelming anything we've had in all of human history. What's more, computers are able to process this information in ways that would take lifetimes for a human being to do by hand. The combination of unprecedented volumes of data with awesome analytical power leads to scientific studies with conclusions that are, well, not obvious. AFP brings us news of something most strange: the color of hurricanes. The main factor is the green tint ocean water takes when there are large concentrations of chlorophyll, a pigment that helps tiny organisms known as phytoplankton convert sunlight into food for the rest of the marine ecosystem. 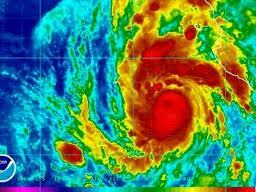 So what causes red hurricanes? Without chlorophyll, sunlight penetrates deeper into the ocean, leaving the surface water cooler. Cold water in turn causes changes in air circulation patterns, forcing strong winds aloft, "which tend to prevent thunderstorms from developing the necessary superstructure that allows them to grow into hurricanes," the researchers said. How many times have we heard from His Greenness Al Gore that global warming will lead to more hurricanes, because hurricanes are caused by warm oceans? Now we find that this is really an indirect link; the chlorophyll in plankton is a more significant cause of hotter ocean surfaces. So there's a simple enough solution: get rid of the plankton, and you can eliminate or reduce hurricanes. Right? ...We vitally depend upon [phytoplankton]. Out in the ocean, infinite numbers of them produce half the world's oxygen and form the base of the marine food chain. For what it's worth, phytoplankton eat crazy amounts of carbon dioxide, a greenhouse gas. But their numbers are down 40 percent worldwide since the 1950s and may be headed down further. The culprit appears to be rising ocean temperatures associated with climate change. The sea's warming top layer of water, where phytoplankton do their job, increasingly lacks life-sustaining nutrients from the cold deep. Now, wait a minute here. We have one article saying that the presence of plankton causes ocean warming and thus hurricanes - and then another article saying that global warming is killing off the plankton. By the same token, global warming is supposed to cause worse hurricanes, but if global warming kills off plankton, that'll make the oceans cooler and reduce the number of hurricanes. Are these guys lying? Are they fools? There is, of course, another answer: We haven't the slightest clue how the Entire Global Climate works; it mostly runs itself and has a myriad of self-balancing feedback mechanisms to keep things within a livable range. By bending over backwards to destroy our economy and lock the climate precisely into its exact position today, we're not only murdering countless millions of people who would otherwise be able to enjoy more well-fed and comfortable lives provided by modern high-energy technology, we're actually taking on an impossible task. We're bankrupting ourselves... for nothing. Meanwhile, Al Gore has become a billionaire and enjoys all the finer things of life that he'd like to deny the rest of us. Fancy that. "We haven't the slightest clue how the Entire Global Climate works"